Wood blinds provide for the most flexibility in window shading by tilting the slats to the desired level of light and privacy. They give a warm rich ambiance to any setting whether as an undertreatment or by themselves. We recommend wood blinds as a more stationary treatment (like a shutter…) since wood slats stack quite heavily when raised. 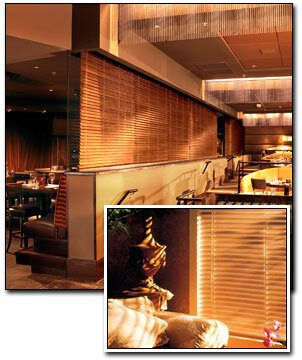 Tilt slats up for maximum privacy. There are many choices for a stain or paint finish as well as size of slats. 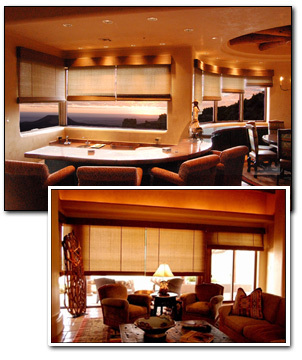 Woven wood shades provide a casual or rustic atmosphere where light, filtering between the woods, gives a warm hue and a rich looking texture to the room. A Roman (stacks in folds) or a rollup are the two most common types. They can be light filtering or blackout depending on the lining used. We recommend a lining to protect wood material, to control light and to increase insulation.